This customary is designed to facilitate the planning of a funeral easier during a very difficult time. We are ready to assist you in making decisions for a beautiful and meaningful service. With that in mind, all arrangements for the funeral are to be made in consultation with the current Rector/Vicar/Priest-in-Charge and they should be notified immediately upon the death of your loved one. In the Episcopal Church, a funeral is a celebration of resurrection. This celebration is expected to be held in the nave (seating capacity of approximately 100), with overflow seating in the former choir room (seating capacity of approximately 40), and seating in the parish house (seating capacity of approximately 100 plus depending on the room needed for a meal or reception, before or after the service. Baptized Christians are properly buried from the church. The service should be held at a time when the congregation has opportunity to be present. There are provisions in the Book of Common Prayer and this customary for the appropriate readings, psalms, and hymns for a funeral service. Please choose those which will make this service the right one for the celebration of the life of the departed and a fitting memorial in the hearts and minds of those who mourn. published in 1979 for its services, including funerals. The Holy Eucharist is customarily celebrated at funerals as, throughout the centuries, a funeral is a celebration of the entrance of the deceased into the nearer presence of God. All Christians present will be invited to participate in and receive Holy Communion. The Prayer Book Service of the Burial of the Dead takes approximately 45 minutes to an hour, depending upon the number of people receiving communion. A sermon is preached at all funerals at St. John’s Episcopal Church. Charge is required according to The Canons of The Episcopal Church (Title III, Canon 9, Section 5a). The Priest who has helped the family members prepare for the funeral is the appropriate priest to perform the burial rites. The location of the funeral other than in the parish church changes nothing; other priests may only function with the permission and invitation, prior to conducting the service, of the current Rector/Vicar/Priest-in-Charge of the parish within the jurisdiction of St. John’s Episcopal Church (Labette County). Although such permission normally is gladly given when requested, this is a matter that can neither be assumed or bypassed. Guest clergy (other than Episcopal priests and deacons) are invited from time to time to read the lessons, lead the prayers, administer Holy Communion, and/or preach. The Book of Common Prayer, the guidelines of which each priest at their ordination has sworn to uphold, is very specific about who may do what. There is a wealth of beautiful and appropriate sacred music that is suitable for use in the context of the Burial of the Dead. Hymns or a psalm or a canticle may be sung or said between the Old and New Testament lessons or after these lessons. It is recommended a hymn be sung prior to the reading of The Holy Gospel. Other places in the service where hymns are appropriate are at the Offertory, after all have received communion and at the recessional. As the funeral is a service of worship designed to involve the entire congregation, we encourage some congregational singing. We also will allow a solo before the service begins and at the Offertory, but at no other time during the service. Hymns referred to in the rubrics of the Book of Common Prayer are to be understood as those authorized by St. John’s Episcopal Church. The words of anthems are to be from Holy Scripture, or from the Book of Common Prayer, or from texts congruent with them. (Book of Common Prayer, page 14). The Canons of this Church give the final authority for the music in any liturgical setting to the current Rector/Vicar/Priest-in-Charge of the parish in which the liturgy is being performed. It is ultimately the current Rectors/Vicars/Priest-in-Charge decision that will be binding with respect to the propriety of any particular music selection. During the service, there will be a reading from the Old Testament, a Psalm (read by the congregation as a whole), a reading from the New Testament, and a reading from the Gospel. Only those readings authorized by the Book of Common Prayer in the Rite of the Burial of the Dead may be used. A deacon, priest, or bishop must read the Gospel. It is recommended that a Lector from St. John’s, or assisting clergy, read from the Old and New Testament lessons and lead the psalm. If the family would like a family member or friend to read a lesson, please take into consideration the emotional state of that person in respect to the deceased. Psalm 106, Psalm 116, Psalm 121, Psalm 130, Psalm 139. A casket spray or flag (Military Funerals) may accompany the casket. Casket sprays will be removed and replaced with a funeral pall upon entering the church. An American Flag will remain on the casket, and will not be replaced with a funeral pall. Altar flowers are encouraged, especially when the Holy Eucharist will be celebrated, otherwise, a floral spray can be brought to the church from the funeral home and displayed in front of the altar. The altar flowers are to conform with the use of the various flower vases available by St. John’s Episcopal Church. The family must notify the current Rector /Vicar/Priest-in-Charge their choice of florist to take the altar flower liner to. The cost of the altar flowers are the responsibility of the family. Other floral sprays and decorations sent by family and friends will not be displayed in the church, but can be displayed in the parish house. The color for the altar hangings and clergy vestments is always white for funerals, because the liturgy for the dead is an Easter liturgy. 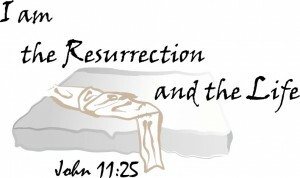 It finds all its meaning in the resurrection. Because Jesus was raised from the dead, we too, shall be raised. St. John’s has a complete set of funeral hangings, vestments, and palls for an adult, child and infant caskets, and cremation urns. A service booklet containing the entire burial service is available by St. John’s Episcopal Church, at the request of the family. Various selections of the cover sheet will be made available for selection by the family. St. John’s Episcopal Church does not provide a guest book for congregation members to sign. In most cases, this will be provided by the funeral home. If this is not the case, then a guest book will be purchased by St. John’s Episcopal Church, if requested by the family, and the cost will be passed onto the family. St. John’s Episcopal Church will provide a dinner, before or after, the funeral service in the parish house, or will take a meal to a family members home. Receptions after the funeral will be provided, upon request by the family, and will be held in the parish hall. This policy is for members of St. John’s Episcopal Church, and does not apply to a “good neighbor” funeral. Ushers are not provided by St. John’s Episcopal Church. In most cases, the funeral home will provide competent and reverent ushers for the service. As for all the services of the Church, all the lay ministers, clergy, and members of the family of the deceased enter in an appropriate liturgical process from the back of the Church. This will be explained and discussed by the officiating priest in the course of preparations for the funeral. The congregation stands at the beginning of the procession and is seated after the opening prayer. The congregation will be invited to stand, sit, or kneel as full participants in the service following the rubrics of the Prayer book, and will be invited to receive communion at the appropria te time and place. Pews will be reserved at the front of the Gospel side of the church for pallbearers and on the Epistle side for family members. Please let the priest know ahead of time how many family members will be seated in the reserved area. On occasion, arrangements may be made for someone to be buried from St. John’s Episcopal Church who was not a member of the parish. These would be “good neighbor” funerals and must adhere to the customary and practice of St. John’s Episcopal Church. The parish hall would be available for a “go od neighbor” dinner or reception hosted by family members or members of the deceased church. If any of these services are not used, the cost of them will be deducted from the $425.00 total cost of these services.